If you missed out on the first two articles, check out Part 1: The Problem and Challenges and Part 2: Learning From Death. Initially, I had planned to make this article a discussion about a whole host of standards by which to classify death mechanics and methods to assign weight to death in games. I had meant to talk about the advantages, disadvantages, applications, relation to the lessons from death, et cetera of each of this wide range of classes. It was going to be a sort of grand finale to what was meant to be a main trilogy (followed perhaps by a few short additions to the series over time). That, however, is not what this article has come to be. You see, as I worked my way through writing this installment, I came to a realization: even given the two previous articles, there was just too much left cram into one installment. Too many points and complexities were going to be cut short or simply forgotten, and the organization and pacing were turning out terribly. It dawned on me that the information needed to be split up throughout more articles. Furthermore, if I was going to have to make this series more than a trilogy, I thought why not include various article ideas I had decided to leave unwritten for the sake of a clean cut three? It was decided then, that this would not be the grand finale to a three-installment series. Instead, it will be the last installment of an initial, largely foundational trilogy for what’s shaping up to be a longer series on death in games and assigning it some well-deserved weight. With that being the case, what is this installment of the series going to cover? Well, last week I promised to cover “ways to classify mechanics (or methods) of assigning weight to death,” and I figure that I can still make somewhat good on that promise. Not only that but with the right standard of classification, it’ll fit rather nicely into the foundational nature these first three installments have taken on. This week I’ll be rounding out this initial trilogy by discussing three main classes of death mechanics based on how they go about assigning weight to death. The first class of mechanics/methods for assigning weight to death is pretty simple and obvious: those which penalize death. More specifically, those mechanics where the player is punished for dying. Often this is done by linking negative effects on player’s experience with dying and/or mirroring one or more of the things we fear about death (as laid out in the last installment). When you think about it, it makes perfect sense: if you want the player of a game to feel like death has some real weight and impact which causes them to avoid it, then make the consequences of death something they want to avoid. The Shrouded in Sanity Vitae mechanic is more or less the same as the souls mechanic in Dark Souls. The figure in the center is the player controlled character. The grim reaper over the ghostly version of the player character is the spot I had to reach without dying in order to reclaim all my lost Vitae. This class is by far and away the most extensive of the those I have identified here. Examples of this classification include games that have some sort of cost when the player dies (for instance, the repair costs for vehicles in WarThunder), games which make the player retrieve items from before they died without dying again (like the Dark Souls souls mechanic or Shrouded in Sanity Vitea mechanic), et cetera. Even games which merely make the player respawn or restore a previous save fit in with the penalty based classification because they have the player lose some progress and repeat part of the game. There are many advantages associated with mechanics which assign weight via penalizing death. The most significant is the vast and flexible variety of mechanics which fall into this classification. This means that there’s almost always a good option no matter what is required for a specific game. The big disadvantage to penalizing death, however, is that you are particularly likely (by comparison to the other two classes) to tip the scales from making death frightening to frustrating. Generally, this is done by making things too punishment oriented or simply through poor implementation. The second class of mechanics/methods of assigning weight to death is those that do so by making the player’s death affect the world of the game. These methods and mechanics serve to attach weight to death by making deaths have a significant impact on a player’s in-game experience. These mechanics are not nearly as widespread as those that penalize death but remain fairly common. 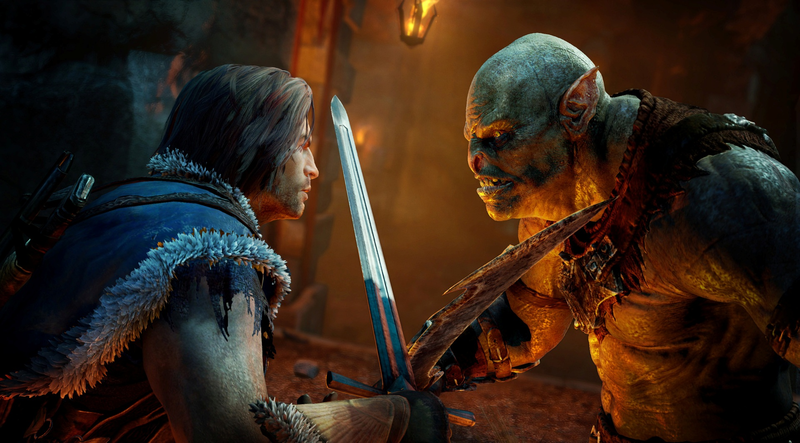 In Shadow of Mordor, the nemesis system meant that the player’s death could lead to observable shifts in the Uruk ranks and lead to the promotion of any lucky enemy. One example of a mechanic which falls into this class comes from Middle-Earth: Shadow of Mordor in the form of its nemesis system. For those unfamiliar, in Shadow of Mordor, an enemy who kills the player will be promoted and become more powerful, even if they were just some grunt. The next time the player runs across that enemy they will have voice lines about remembering the player and killing them before. The result is that you (as the player) can see how your death affects the world of the game through the enemy command structure and specific enemies you’ve tangled with in the past. Mechanics in this class are powerful in their ability to attach weight to death due to their tangible effect on the world around the player (at least virtually speaking). The only major drawback, creatively speaking, is that this class of mechanic does restrict to an extent how coming back from death can work. The final class of mechanics/methods of assigning weight to death (at least that we’re discussing today) is those which have the player’s death affect the story of a game. In the first installation, I said that this series was not concerned with scripted narrative deaths that are part of the story of a game. That remains true. This classification is for games which allow for the death of the player controlled character(s) due to player action to affect the story experienced by said player. This is a less than crowded classification, with very few games possessing the right structure (and perhaps ambition) to employ such mechanics. A game like this must, as far as I can tell, be set up to enable the player to continue playing after death while also having the game’s timeline be linear for cause and effect. This reveals one of the significant disadvantages of the class: it’s hugely limiting with how a game can handle death. As far as the advantages go, it allows for the potential of emotional and narrative elements to be attached to the death of player controlled characters due to player action. Generally speaking, that simply doesn’t get to happen very often. As such, the mechanics in this class provide a powerful but rare force for assigning weight to death. The butterfly in Until Dawn was used to display the various routes the story could go down. One of these rare games which allow for the death of player controlled characters to affect the story is Until Dawn. In Until Dawn, the player controls a large cast of characters, and each one can be killed at various times as a consequence of player decisions or actions. These player decisions and resulting deaths determine which path the story takes towards a multitude of possible endings. Thanks for reading this somewhat improvised third installment of Assigning Weight to Death in Games. While not exactly what I had planned to do this week, I hope you still got something out of it. You should now have a general understanding of the three classes of mechanics mentioned. As I talked about in the first paragraph, the series will actually be expanding. I started this series wanting to have a genuinely in-depth discussion and look at death in video games, and I don’t plan to stop until I feel that’s been done. I can’t tell you for sure when the next installment will be coming, so please be sure to follow us on Twitter or Instagram or to check back regularly if you’re interested in the series.